This work, Radical Islam and Civil Conflict in Africa, is written by a two-time Fulbright-Hays Fellow who currently serves as course director of global and world history courses within the University of Maryland University College system. The author, Norman C. Rothman, Ph.D., has written numerous published works related to Islam. 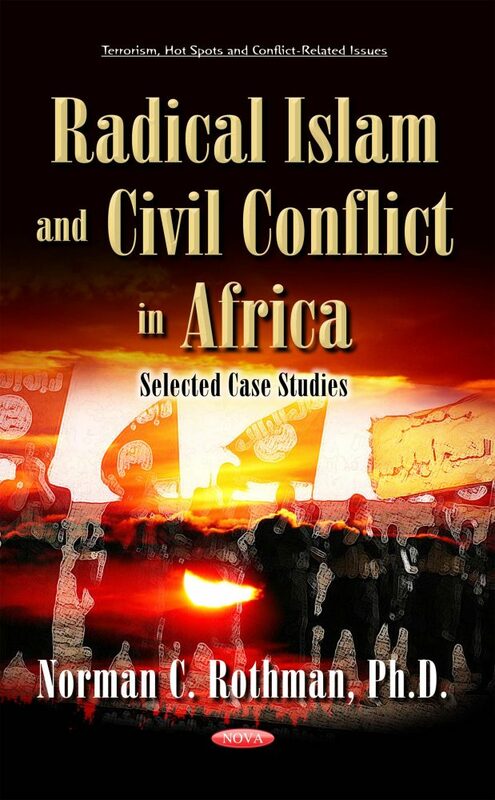 This work serves to highlight recent and continuous struggles between Islamic militant forces and civil societies in North Africa, West Africa, and East Africa. The countries that will represent these regions are Libya, Nigeria, and Somalia. These countries are currently witnessing conflicts with no end in sight. The book examines the roots of these conflicts and analyzes the reasons for their continuance. It goes on to assess possible outcomes for these internecine struggles, which appear to have become endemic to these countries. This work also delves into the causes of the growth of radical movements and provides insight as to why they have attracted and continue to attract support. It concludes with recommendations for resolving these conflicts, which at present appear to be permanent and intractable. The book is directed to those who have both a general and specific interest in comparative religion, recent history, international relations, Africa, and Islam. North Africa: Libya: A Failed State? It should appeal to both for the lay person, and the individual who is involved in the topic. For groups or individuals involved or interested in the areas of Islam, religion. history, politics, and society and culture, the book should have special appeal.